Troops from 8th Brigade, 3rd New Zealand Division, landed on Mono in the Treasury Islands to help clear the island of Japanese forces. 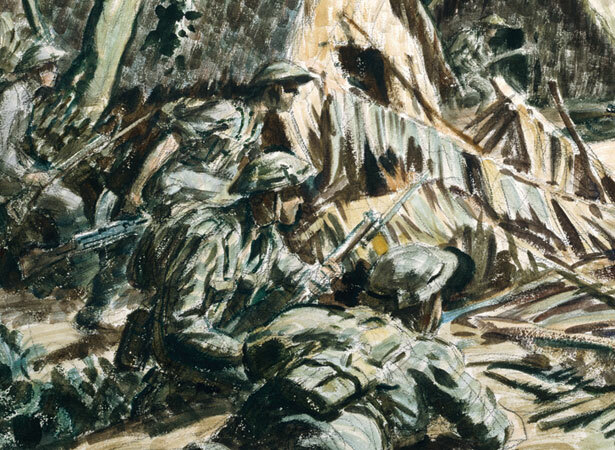 This was the first opposed landing by New Zealand troops since Gallipoli (see 25 April). The 3rd New Zealand Division arrived at Guadalcanal in the Solomon Islands in mid-September 1943. A month later, they received orders to seize and hold Stirling and Mono Island, where the Americans planned to establish a long-range radar station. The New Zealanders landed on Mono Island at about 6.25 a.m. Despite enemy machine-gun fire, the New Zealand and American forces managed to establish a beachhead. By the end of the day, 21 New Zealanders had been killed and 70 wounded. Although the Japanese defenders were outnumbered, Mono’s geography afforded them some protection. The island rose steeply from the sea, and dense forest cover concealed many caves in which the enemy was able to hide. Clearing the island was a slow and difficult task. Although the island was declared clear of Japanese forces on 7 November, isolated enemy positions held out for weeks longer. We have 9 biographies, 17 articles, related to First opposed New Zealand landing since Gallipoli.